“So, we came up with an idea of having our old drummer do a cameo appearance in the music video. Matt Wolfe left the band right before we signed with Metal Blade and had occupied the drum seat for the last 12 years. We felt it was a perfect opportunity to let fans know that we still love Matt and he’s still welcome and important to our band. What’s the best way to have an ousted band member make a cameo? To hit me with a vehicle, of course! 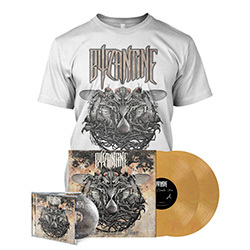 In conjunction with PledgeMusic, The Cicada Tree can also be pre-ordered at: pledgemusic.com/projects/byzantine2017 – where you can reserve your copy of the album, signed material from the band, apparel, and more.